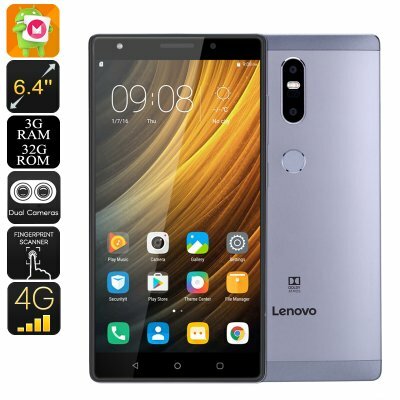 Successfully Added Lenovo Phab 2 Plus Android Smartphone - Dual-SIM, Octa-Core CPU, 3GB RAM, Android 6.0, 6.44 Inch FHD, 4G, 13MP Dual-Cam (Gray) to your Shopping Cart. Enjoy games, movies, and applications on the go with the stunning Lenovo Phab 2 Plus Android smartphone. Featuring a large 6.4 Inch display, this phablet brings along a great visual experience that allows you to enjoy your favorite media in their purest forms. 1080p resolution brings forth crisp details and vivid color – letting you take the absolute most out of the latest series, movies, and games alike. With 128GB external memory support, this Android mobile phone packs plenty of storage for you to fill up – guaranteeing that the next time you head out, you’ll always have the means necessary to stay entertained throughout the day. Packing a powerful Octa-Core CPU along with 3GB of RAM, this cheap Android smartphone is capable of dealing with all sorts of media without dropping a frame. The Mali-T720 graphics unit that this Android phone holds further adds to your overall user experience by delivering mesmerizing graphics whenever engaged in games or movies – truly letting you take the most out of this beautiful Android mobile phone. With its epic 4050mAh battery, it lets you enjoy all it has to offer for up to 5 hours continuously – enough to get through a media filled day without needing to recharge your Android mobile phone. Thanks to its two SIM card slots, 4G support, and Dual-Band WiFi – this Android phablet provides great connectivity. By allowing you to be reachable on two phone number simultaneously, this 6.4 inch phablet is perfect for those that often travel abroad or wish to separate their busy work and private life by using just one mobile phone. Added to that, its 4G connectivity and ultra-fast WiFi support make sure that you’ll always be able to browse the web, stream movies, and download files in the blink of an eye. No matter where you’ll be headed next – With this Android mobile phone at your side, you’ll always stay connected. Unlock your Android mobile phone in the blink of an eye thanks to the mobile’s ultra-fast fingerprint scanner. No longer will you have to remember annoying passwords or difficult unlocking patterns as with this fingerprint scanner, you’ll be able to access all your files with the touch of a finger. The rear of this cheap Android smartphone furthermore holds a stunning 13mp dual-camera that lets you shoot breathtaking photographs and FHD video at any time. From now on you’ll be able to capture and share all those special moments in life with friends, family, and loved ones thanks to the Lenovo Phab 2 Plus Android phone. This phablet comes with a 12 months warranty, brought to you by the leader in electronic devices as well as wholesale electronic gadgets..